The classic 4 day Inca Trail to Machu Picchu is probably the world´s most famous trail. And with a good reason! 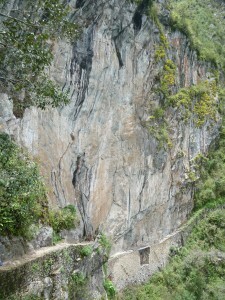 The Inca trail leads over high mountains and through the high forest of Machu Picchu. 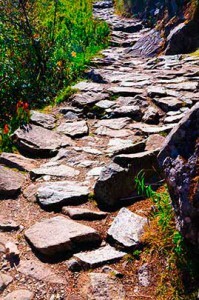 This path was part of an extensive network of trails, Qhapaq Ñan. It is a route of approximately 23.000 kilometers and runs through Tahuantinsuyo, the Inca Empire of Peru, Ecuador, Colombia and Bolivia and parts of Brazil, Chile and Argentina. Chasquis used this network to bring messages, for example from Quito to Cusco (a distance of 1980 kilometers) in only 5 days. The classic Inca Trail is a four day trek which ends in Machu Picchu. This trek is an almost 43 kilometers long adventure through the ancient trails of the Incas. Along the trail you will visit magnificent ruins. You will pass a mountain of 4200 meters of altitude. And you will have stunning views off snow-covered peaks and walk through the cloud forest, close to the Amazon jungle. 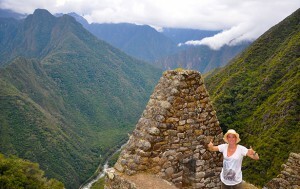 You will see the impressive sight of Machu Picchu from the viewpoint of Inti Punku, the Sun Gate. Then you know that you finally made it all the way to the beautiful world wonder of Machu Picchu! Early in the morning of our first day we will drive from Cusco to Veronica (5850 meters) which is located 82 kilometers from Cusco, where you have a fantastic view. We will go a little down and start our adventure. The first day of hiking is not too difficult and takes around 5 hours, till we reach our campsite at around 3000 meters. The second day is the toughest, because you have to climb the so called „ Dead Woman´s Pass“. This is the highest point of the Inca Trail, a climb of approximately 1200 meters. After lunch, we walk down to our camp which is located at about 3600 meters. The third day of the trek starts with a climb, but this time it is „only“ to 3850 meters. After this climb it goes downhill most of the trail. Prepare yourself for about 2000 Inca stairs, descending into the cloud forest and to the fantastic ruins of Wiñaywayna (Forever Young). After this trek you can take a warm shower, eat a good dinner and maybe drink a beer, so you will be ready for the last day! The fourth and last day is easier; but we leave very early in the morning. This way we arrive at Machu Picchu before the first sunrise. Once there, you will have a guided tour to explore the “Lost City of the Incas“. In the afternoon we take the bus to the village of Aguas Calientes and from there back by train and bus to Cusco where the program ends. • No support for your personal belongings, including sleeping bag and mattresses. You can hire an additional porter (maximum of 12 kg.) for the trail at an extra cost. Please let us know if you prefer this. Due to strict regulations, you need to bring your passport when you enter Machu Picchu. It is very important, that the number of your passport matches with your entrance ticket. If you need to renew your passport, take the old one and the new passport with you and please inform us about this. If you do not bring your passport, possibly you are not allowed to enter Machu Picchu. Furthermore the tickets are strictly personal. It is not possible to change the date or give it to another person. After we buy the ticket and confirm your reservation we can not change anything – not even for medical reasons. Book your classic 4 day Inca Trail to Machu Picchu now!